Это оригинальная версия статьи, перевод на руский язык читайте здесь. During excavations at Uppåkra in Scania, Sweden, an exceptional copper alloy mount in the shape of a winged human was found. The figure is unique not only in its exquisite craftsmanship, but also in its iconography. It is argued that the mount was made in the 10th century AD and that it depicts Wayland the Smith. 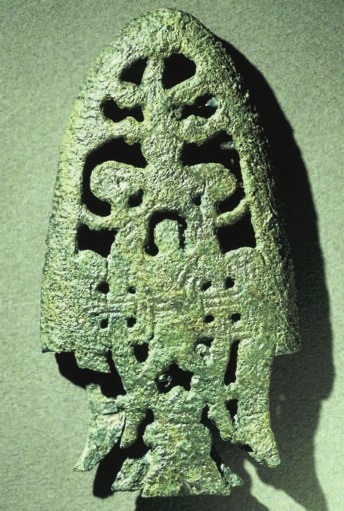 During excavations at Uppåkra, one of Scandinavia’s largest and richest Iron Age central places, yet another unique find was made in September 2011 (fig. 1). It is an exceptionally large and heavy mount, measuring 7,4 cm in length, 4,5 cm in width, and weighing 52,6 g. It is cast in copper alloy and gilded on all sides. The object is openwork high relief. A human figure, seen from the back or above, is grasping a pair of feathered wings with both hands. His arms are ribbed; his legs, ribbed on the knees and wearing boots, are splayed under the wings on both side sofa feat hered bird tail. The body, which appears to wear some type of armour, is intertwined with what seems to be a flying device: the human thighs are surrounded by a double ribbon that connects them to the bird tail, while the upper part of the body is intertwined with double and triple ribbons connecting the wings. On closer in spection it turns out that it is not possible to read the individual parts as either parts of the human body or of the flying device. The legs continue upwards into the dotted abdomen that is connected to the dotted upper body, which finally continues into the wings. The human arms, in turn, continue under and above the ribbons connecting the wings. The human body parts and the flying device thus cannot be separated clearly. These peculiar pictorial structures might partly be explained by a common 10th century manner of stylisation, the ring-chain motif. Fig. 1. Mount from Uppåkra. Photos B. Almgren, LUHM. Fig. 2. Head-shaped pendant from Vidarshof, Norway (Hagen 1950, pl 17). The head, more rounded than the rest of the mount and looking upward, has grooved hair that is parted by a double line in the middle. The eyes are large and almond-shaped. There is a beard on the pointed chin, but no moustache. The ears on the sides of the head are round and reminiscent of animal ears. A curved line that connects the eyebrows might indicate a head dress or helmet. The mount’s back is unworked. There are three iron rivets, all visible on the front side of the mount as well. One is in the middle of the lower dotted structure on the vertical symmetry axis, the other two in the upper parts of the wings. These two are surrounded and enhanced by double-carved ribbons. They seem to be carefully placed and thus probably original. The mount is slightly bent transversally, while it is straight along the head-tail-axis. All this could indicate that the mount once was used as a sword scabbard chape. On the other hand, most Viking Period scabbard chapes are much smaller and lighter, their reliefis flatter, and they are double-sided to protect the scabbard on both sides. These traits make an original use of the object as a scabbard chape rather unlikely. The Uppåkra mount was probably also gilded on the backside (pers. comm., Lovisa Dal, restorer, Lunds Universitets Historiska Museum), which seems unnecessarily costly. The object is not worn at all. Thus, it seems unlikely that the mount arrived at Uppåkra as scrap metal for recasting, like so many other items found there. Instead it seems to have been deposited intentionally. It was found near the foundation of an unusual building, the so-called cult house (Larsson 2004), directly under an intact layer of burnt and fragmented stones (pers. comm., Bengt Söderberg, head of excavations). The figure’s head is similar to other finds from the Viking Period. 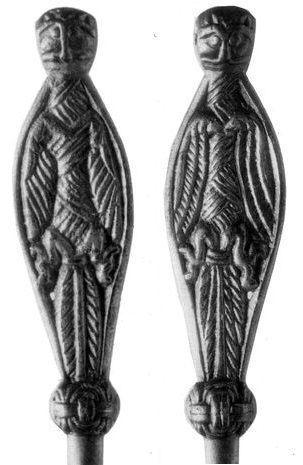 The closest parallel is a head-shaped pendant from Vidarshof in Hedmark fylke in Norway, found in a Vendel or Viking Period cremation grave (Hagen 1950), which resembles the head of the Uppåkra figure with its overall shape, the grooved, parted hair, the almond-shaped eyes, the round ears and the beard (fig. 2). The grave was excavated in the late 1800s. Apart from the head-shaped pendant, it contained only a pendant with Vendel Period animal art. A comparison of stylistic elements offers possibilities for a narrower dating. As mentioned, the Uppåkra figure’s body is intertwined with the flying rig and cannot be separated from it. The dotted structures, which at first sight seem to be the figure’s body, have a central opening with two ribbons through them, crossing each other at a right angle. This so-called ring-chain motif is a common element of the Borre style (Wilson 1995, pp. 88-89) and appears from the middle or the second half of the 9th century on wards (ibid., pp. 107-108). Ring chains also occur in the Jelling and Mammen styles. One example is the wooden figure from the North Barrow at Jelling (fig. 3; Krogh & Leth-Larsen 2007). Its body is bound by something resembling a ring chain, both on the waist and on the outstretched arm. The ring chain is a stylistic element that was in fashion at that time, but it was not just meaning less decoration. It appears to have been highly significant and connected to ideas of binding and overcoming (Oehrl 2011; Helmbrecht 2011, pp. 134-138). Fig. 3. 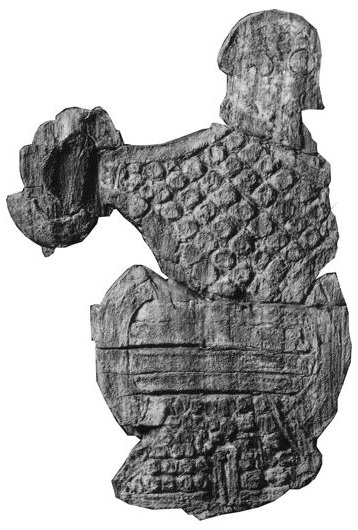 Wooden figure from Jelling (Kjærum & Olsen 1990, p. 193). Fig. 4. Pendant from Tissø. Photo National Museum, Copenhagen. Fig. 5. Sword scabbard chape from Birka. Photo C.O. Löfman. Fig. 6. Sword scabbard chapes with bird motifs: a. Tannstaðabakki, Iceland (Eldjárn 1956, p. 272), b. Bjergene, Ballerup sn, København amt (NMK C 34512; photo M. Axboe, National Museum, Copenhagen). 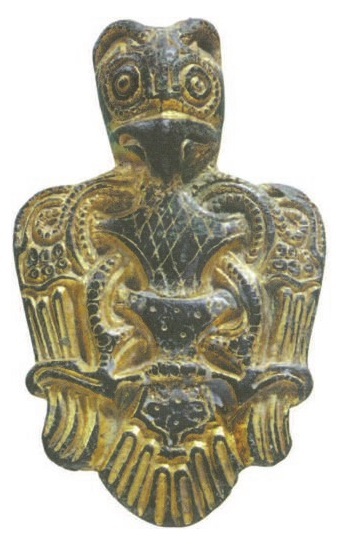 As a further parallel, the Jelling figure’s body is covered with a repeating pattern, just like the Uppåkra figure – indicating armour? The burial chamber in the North Mound was built in 958/59 (Christensen & Krogh 1987), which gives a terminus ante quem for the wooden figure and indicates a similar date for the Uppåkra piece. Similar bodies with internal repeating patterns and double body outline are a common feature of 10 th century animal art, that is, the Jelling and Mammen styles (Fuglesang 1991; Wilson 1995, pp. 114-127). 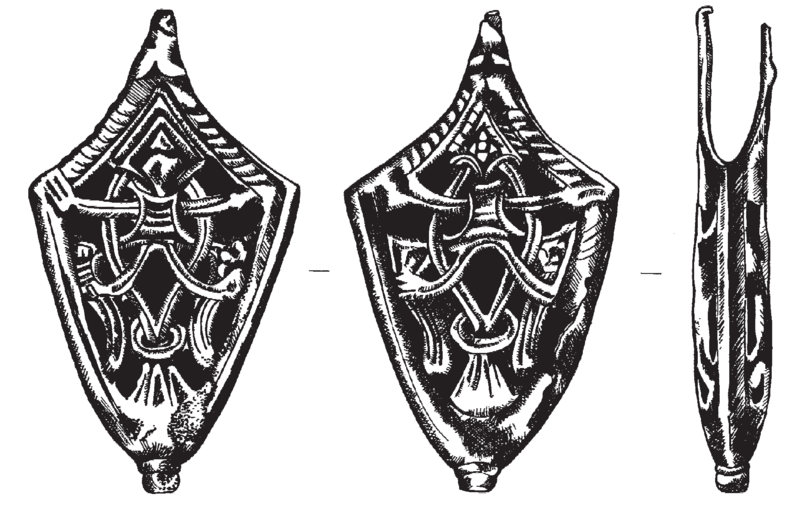 In 1995, a pendant was found at Tissø on Zealand in Denmark (fig. 4). 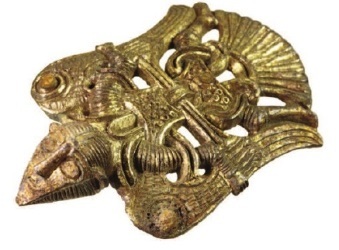 Like the Uppåkra mount, it is cast in copper alloy and gilded. Its shape and pictorial structure is similar to the find from Uppåkra, especially the intertwined body elements, the shape and the patterning of the wings. However, it shows a bird, looking towards the viewer, and it is much smaller than the Uppåkra piece. Probably the closest overall parallel to the Uppåkra mount is an 88 mm (!) sword scabbard chape found in a controlled stratigraphic context in Birka's Black Earth (fig. 5; Ambrosiani 2001). One side shows a stylized falcon, the other a bird with an inscribed human figure – note the splayed legs that are similar to the Uppåkra piece. Björn Ambrosiani (2001, pp. 11) dates the chape’s deposition context to the mid-tenth century. 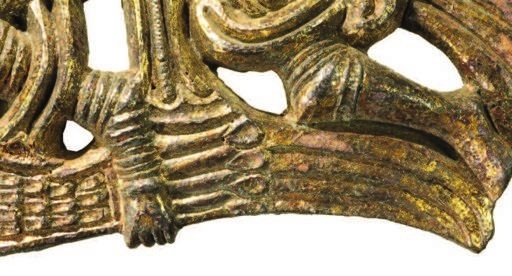 The overall composition and important details of the Uppåkra piece and the aforementioned finds – the openwork technique, the shape of the wings, the feathered tail, the ”tail loop”, body elements intertwined like ring-chains, paws or hands gripping the outer rim or the wings, the horizontal ribbons connecting the wings – all are reminiscent of a homogeneous group of sword scabbard chapes that were manufactured during the second half of the 10th century and the early 11th century (fig. 6; Strömberg 1951; Janowski 2006). 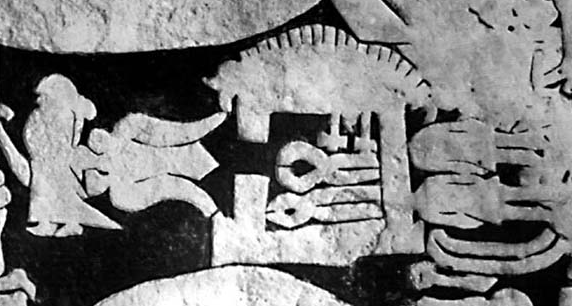 In contrast to the Uppåkra mount, the upper part of these chapes – that is, the area where the head should be – is always more or less illegible. There are lines, dots, sometimes even a triquetra, or geometric structures. These sword scabbard mounts are rather rare, but have been found across a vast area comprising Iceland, large parts of Scandinavia, the Polish coast and even Bulgaria. These parallels indicate that the Uppåkra mount was probably produced during the middle or second half of the 10th century AD. Who might this winged figure be? 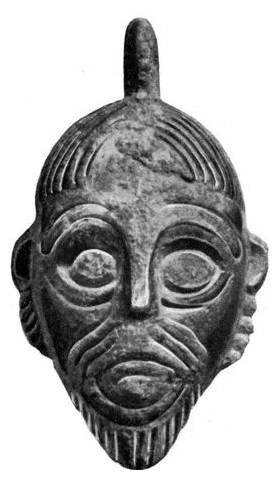 Thoughts go immediately to the well-known story of Wayland the Smith that is reported in Völundarqviða and Þiðreks saga, amongst others (Betz 1973; Nedoma 1988; Pesch et al. 2006). Wayland, an exceptionally capable smith of supernatural descent, was captured by king Nidud, who also had Wayland hamstrung to prevent the smith from fleeing. Wayland was then forced to make jewellery for the king’s family. But the smith exacted a brutal revenge by killing the king’s two sons and making drinking bowls with silver fittings out of their skulls. Wayland also raped the king’s daughter and left her pregnant. Finally, he managed to flee from captivity using a flying device made of bird feathers. It is also mentioned that Wayland said about himself that he was both man and bird1 – which corresponds well with the Uppåkra mount’s depiction. Fig. 7. Gotlandic picture stone, Ardre VIII, detail (Lindqvist 1941, pl. 67, fig. 165). Fig. 8. Gotlandic picture stone, Lärbro St Hammars III (drawing by author after Nylén & Lamm 2003, p. 51 and Lindqvist 1947, p. 25, fig. 3). Fig. 9. Pin (seen from front and back), Norelund, Gästrikland, Sweden. Photo ATA. Fig. 10. Mount from Uppåkra, detail. Photo B. Almgren, LUHM. Several other depictions of the Wayland narrative are known. The earliest is an early 8th-century Northumbrian work, the Franks casket, where on the front side we see Wayland holding a human head with a tong in one hand, while handing over another skull to a woman, most probably the king’s daughter. A decapitated body is shown lying on the floor (Betz 1973, pp. 98-101; Nedoma 1988, pp. 10-20; Pesch et al. 2006, pp. 610-612; Webster 2011). 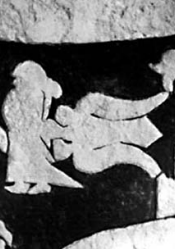 On the Gotlandic picture stone Ardre VIII is a smithy with tools, two decapitated horizontal figures and a bird-like figure flying away to the left (fig. 7). This scene is commonly interpreted as Wayland fleeing from captivity (Lindqvist 1942, p. 24; Betz 1973, pp. 88-92; Buisson 1976, p. 76; Böttger-Niedenzu 1982, pp. 82–83; Nedoma 1988, p. 29; Oehrl 2009). Another Gotlandic picture stone, Stora Hammars III (fig. 8), shows a man disguised as or transformed into a bird of prey and meeting a woman. Sune Lindqvist (1941, p. 95) identified this as Odin shape-shifting into an eagle and stealing the mead of poetry from the giant Suttung. Beata Böttger-Niedenzu's investigations (1982, p. 14) raised doubts about this reading. According to Sigmund Oehrl who examined the stone recently, the stone is now badly weathered. Björn Ambrosiani (2001) interpreted the Birka scabbard chape (fig. 5) as Odin disguised as an eagle. All these renditions show close similarities to the Uppåkra mount. The Old Norse literature states repeatedly that gods and some giants could wear bird disguises or transform themselves into birds (Helmbrecht 2011, p. 178w.refs.). For example, the giant Thjazi appears in the shape of an eagle to abduct Idun and steal her apples, Freya owns a falcon dress that Loki sometimes borrows, and the above mentioned giant Suttung also turns into an eagle in order to chase Odin who has stolen the mead of poetry. In Viking Period art, human-animal transformations are common, especially in the animal styles. For example, a Viking Period fragment of a pin or tool, found at Norelund in Gästrikland, shows a bird with a human head (fig. 9). Thus, not every winged figure with a human head has to be Wayland. It is probably more appropriate to understand both the textual and the archaeological sources as mirrors of a common Viking Period concept of bird transformations. People at Uppåkra obviously knew this version of the Wayland story. Both the mount’s detailed iconography and its quality of craftsmanship confirm Uppåkra’s outstanding role in Scandinavia even in the later 10th century. My work with the find was made possible through a generous grant from Svenska Fornminnesföreningen. Thanks to Bengt Söderberg for generously sharing information on the find and its context, Iohannes Miaris Sundberg for comments on a draft of this manuscript, and Lydia Carstens for help with the translation of the Old Norse texts. Ambrosiani, B., 2001. The Birka Falcon. Ambrosiani, B. (ed.). Eastern Connections. Part One: The Falcon Motif. Birka Studies 5. Stockholm. Betz, E-M., 1973. Wielandder Schmied: Materialienzur Wielandüberlieferung. Materialien zur Wielandüberlieferung 2. Erlangen. Böttger-Niedenzu, B., 1982. Darstellungen aufgotländischen Bildsteinen, vorallemdes Typs C und D, unddie Frage ihres Zusammenhanges mit Stoffen der altnordischen Literatur. Magister-Hausarbeit. Ludwig-Maximilians-Universität München. Munich. Buisson, L., 1976. Der Bildstein Ardre VIII auf Gotland: Göttermythen, Heldensagen und Jenseitsglaube der Germanen im 8. Jahrhundert n. Chr. Abhandlungen der Akademie der Wissenschaften in Göttingen, Philologisch-historische Klasse, Dritte Folge 102. Göttingen. Christensen, K. & Krogh, K.J., 1987. Jelling-højene dateret. Kristendommens indførelse og Gorm den Gamles død. Nationalmuseets Arbejdsmark. Copenhagen. Eldjárn, K., 1956. Kuml og Haugfé. Úrheiðnum sið á Íslandi. Reykjavík. Fuglesang, H. S., 1991. The axe head from Mammen and the Mammen Style. Iversen, M. (ed.). Mammen: grav, kunst og samfund i vikingetiden. Jysk Arkaeologisk Selskabs Skrifter 28. Viborg. Hagen, A., 1950. Etfunnfra Vidarshov ved Aker, Vang, Hedmark. Viking 14. Oslo. Helmbrecht, M., 2011. Wirkmächtige Kommunikationsmedien – Menschenbilder der Vendel- und Wikinger- zeit und ihre Kontexte. Acta Archaeologica Lundensia, Series Prima in Quarto 30. Lund. Janowski,A.,2006.Brązowe i Srebrne Trzewiki Pochew Mieczyz X–XIII W.Z Terenu Polski. Uwagio Proweniencji i Datowaniu. (Bronze and Silver Chapes of the 10th–13th Century Swords From the Territory of Poland. Remarks Concerning their Origin and Dating). Studies and Materials – Acta Militaria Mediaevalia 2. Sanok. Janowski, A. & Fudzińska, E., 2006. Trzewik pochwy miecza z miejscowości Podzamczekoło Kwidzyna. (Sword Scabbard Tip from Podzamcze near Kwidzyn). Pomorania Antiqua 21. Gdansk. Jensen, J., 2004. Danmarks Oldtid. Yngre Jernalderog Vikingetid 400–1050e. Kr. Copenhagen. Kjærum, P. & Olsen, R.A. (ed. ), 1990. OldtidensAnsigt. Faces of the Past: Til Hendes Majestæt Dronning Margre the II 16. april 1990. Copenhagen. Krogh, K. J., & Leth-Larsen, B., 2007. Hedensk og kristent. Fundene fra den kongelige gravhøj i Jelling. Herning. Lindqvist, S., 1941. Gotlands BildsteineI. Stockholm. – 1942. Gotlands Bildsteine II. Stockholm. – 1947. Daggängs-Monumentet. Gotländskt Arkiv 19. Nedoma, R., 1988. Die bildlichen und schriftlichen Denkmäler der Wielandsage. Göppingen. Nylén, E. & Lamm, J.P., 2003. Bildstenar. Katalog över samtliga på Gotland kända bildstenar samt bibliografi över bildstenslitteratur. 3. utvidgade och kompletterade uppl. Stockholm. Oehrl, S., 2009. Wieland der Schmiedaufdem Kistensteinvon Alskog kyrka und dem Runenstein Ardre kyrkaIII–Zurpartiellen Neulesung und Interpretation zweiergotländischer Bildsteine. Heizmann, W. (ed. ), Analecta Septentrionalia. Beiträge zur nordgermanischen Kultur und Literaturgeschichte. Festschriftfür Kurt Schier. Berlin. – 2011.Vierbeinerdarstellungen auf schwedischen Runensteinen. Studien zur nordgermanischen Tier-und Fesse- lungsikonografie. Berlin. Pesch, A.; Nedoma, R. & Insley, J., 2006. Wieland. Reallexikon der Germanischen Altertumskunde 33. Berlin, New York. Strömberg, M., 1951. Schwertortbänder mit Vogelmotiven aus der Wikingerzeit. Meddelanden från Lunds Universitets Historiska Museum. Lund. Webster, L., 2011. The Franks Casket. London. Wilson, D.M., 1995. Vikingatidens Konst. Lund. Michaela Helmbrecht, 2012. A Winged Figure From Uppåkra. Fornvännen 107. Stockholm. 1. Sagan om Didrik av Bern, Skokloster manuscript from c. 1500: "weland swarade jak är bade man ok fogell”, chapter 75 (www.nordlund.lu.se, 2011-12-17); Þiðreks saga af Bern–Velents þáttr smiðs: "núemekfugl, ok nú em ek maðr”, chapter 78 (www.heimskringla.no, 2012-01-15). 2. Þiðreks saga af Bern – Velents þáttr smiðs: ”Egill leggr ör á streng ok skýtr undir hönd Velent ina vinstri, ok fellr nú blóð á jörð”, (www.heimskringla.no, 2012-01-15). The idea that the droplets may represent Wayland's blood was suggested to me by Iohannes Miaris Sundberg and Bengt Söderberg.